You may have a few terabytes of space in your hard drive, but, that may not be enough. We need storage space for our work and personal files, our endless collection of images, and our software, apps, and games. Beyond that, we need to back up our files so they’re safe if one hard drive fails. Unless you’re one of those few who only use their computers to watch movies and play solitaire, your demand for storage space is going to be insatiable. That’s where external hard drives come in. They provide additional storage space for files and backups. They also let you keep your files portable because you can unplug an external drive and take it with you. But not all drives are created equal. Here’s what you need to know before you buy. Like most computer peripherals, hard drives come in many shapes and sizes… or rather storage capacities, read/write speeds, and connector types. Before investing in one, consider what you need out of yours. How much space you actually need? For backups, start by checking how much storage space you’re currently using, then add room to grow. If you’re a photographer, videographer or artist, you’ll probably need one with 1 or 2 terabytes. If you’re mostly using it for everyday files, a 256GB or 500GB hard drive should last you a long while. How fast should the drive be? Thunderbolt 2 connections move data faster than USB 2.0 or USB 3.0, which means you can move files back and forth quickly. Solid state drives (SSD) are also faster than hard disk drives (HHD). However, higher speed means a higher price. How portable should the drive be? If portability is a priority, you’ll want a drive that’s compact and rugged. Do you have sensitive files you need to keep away from prying eyes? You’ll want one that offers encryption and other security measures. 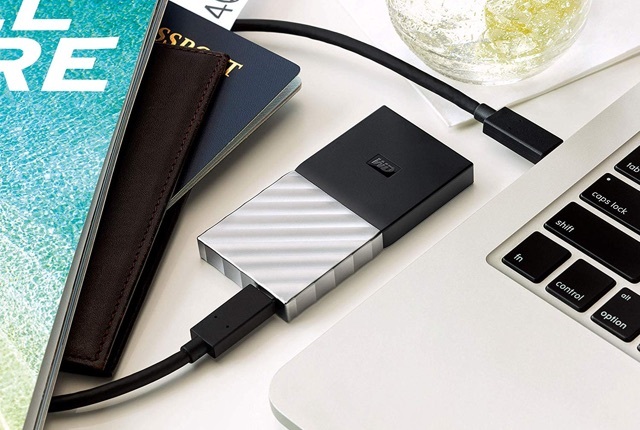 At just under $100, Western Digital’s My Passport combines plenty of storage space with speedy transfer rates that are good enough for professional creatives. But even for a budget price, it does more than the basics. It has 256-bit AES hardware encryption — a hard-to-crack cipher — and password protection to keep your files private. It’s rugged and portable for easy carrying, with shock tolerance and a petite 4.33- by 3.21-inch size. Most importantly, it makes backups simple with automatic backup software. If you’re a constant traveler you may need a drive that’s built to withstand just about any abuse. LaCie’s Rugged Mini fits the bill: it’s weather-resistant, can withstand four-foot drops, and holds up under 1 ton of weight. And at only 5.31 by 3.39 inches, you can take this baby out on the field. This LaCie external hard drive has a transfer rate of up to 130Mbps via USB 3.0 connection so it’s pretty fast, making it a great choice for photographers and videographers. It also includes a 2-year Seagate Rescue Data Recovery Service so if it ever stops working, you won’t have to pay to recover your data. Using the LaCie software, you also have the option to set up automatic backup and password protection. 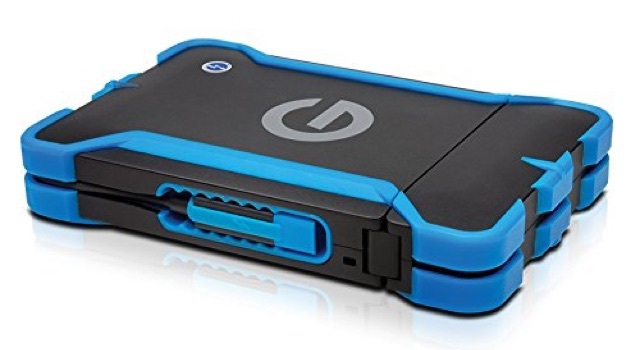 If your backup drive goes everywhere you go, you may want to splurge on a portable external hard drive that’s ruggedly built for an all-terrain situation. 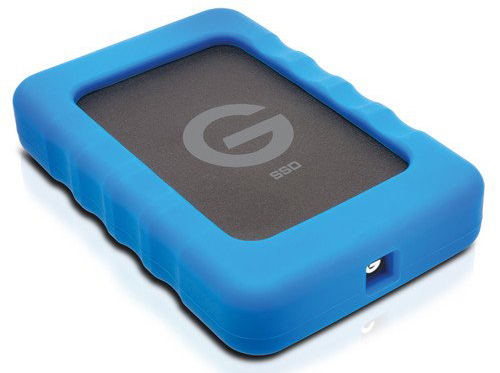 G-Tech’s G-Drive ev ATC with Thunderbolt is watertight, and thoroughly protects your data from pressure, and shocks. A tethered Thunderbolt cable built into the drive means you’ll never lose access because you’ve forgotten to pack a cable. This hard drive can withstand just about anything you throw at it. Let’s not even mention the fact that floats in water, so even if you drop it in the river while you’re out adventuring, your files are safe. At 6.46 x 4.25 x 1.20 inches in size, its protective case bulks it up but it’s still quite portable. At 7200rpm with a transfer rate of just 136Mbps, it’s slower than some drives, but you’re buying this drive for safety rather than speed. This is an ideal solution for adventure types who do not need as much storage space. If you need a drive that’s super reliable, then you need one with RAID support. RAID is a technology that uses several disk drives working together for increased performance, and reliability — making them perfect drives for backups. 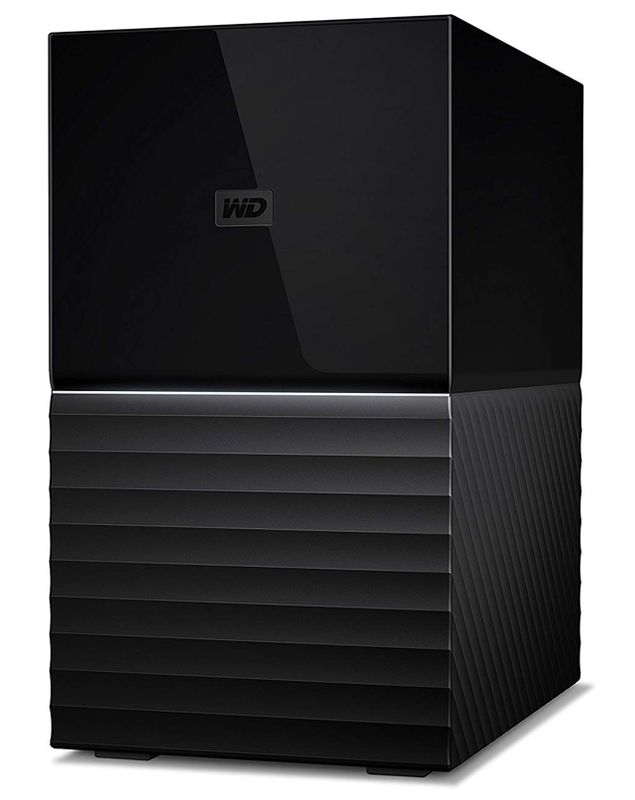 Western Digital has you covered with its My Book Duo, which has from 4TB to 20TB of storage space with both RAID-0 and RAID-1 modes, up to 360Mbps sequential read speeds, and USB 3.1 connectivity. And for security, it offers a 256-bit AES hardware encryption and password protection. At 7.09 x 6.3 x 3.94 inches, it’s not exactly portable: instead, it’s more of a permanent fixture on your desktop. These drives come in several storage capacities, starting at 4TB, for around $260. That’s just the price you’ll pay for a drive with this much reliability. 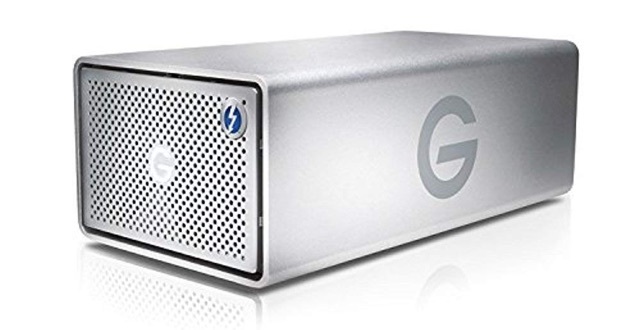 If you need a reliable drive with high-performance and lightning fast speeds, you want the G-RAID with Thunderbolt 3. This powerful dual drive offers RAID-0 and RAID-1, can daisy-chain with up to 6 devices, and has several connectivity options to help it fit into your computing setup. This G-RAID drive boasts a drive speed of 7200rpm and a transfer rate of up to 500Mbps, which is excellent for handling 4K files and video applications. It’s not exactly portable, but it is smaller than most RAID devices at only 3.58 x 9.92 x 5.12 inches, so it won’t take up too much desk space. This does come at a price, the 8TB option will set you back about $600, but it’s a very sound investment that will keep your backups safe for a very long time. SSDs don’t have to be expensive: Western Digital’s My Passport SSD offers SSD speeds at budget prices. It boasts an incredibly fast 540Mpbs of transfer speed, plus plentiful connectivity options including USB 3.0, USB-C and USB 2.0. The features don’t stop with speed and flexibility. Though it isn’t weather resistant, this drive will withstand a drop of up to 6.5 feet, so it’s fairly sturdy — a great feature in a portable (3.5 x 1.8 x 0.39 inches) drive like this one. To keep your files secure, the drive offers 256-bit AES hardware encryption and password protection, and for Mac users it’s compatible with the Apple Time Machine. 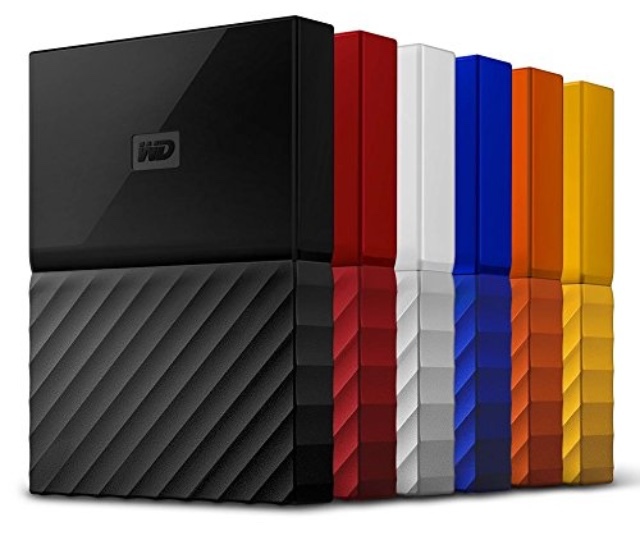 Best of all, this solid state beauty will only set you back around $180 for 1TB of data storage. Solid state drives save energy, produce less heat, and are both faster and quieter than standard hard disk drives. Unfortunately, all that also comes at a cost: the drive starts at $350. 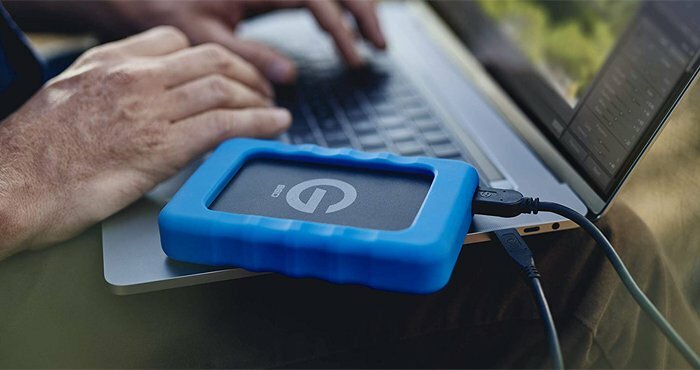 But if you need a speedy drive that’s tough enough to take everywhere, you want G-Technology’s G-Drive ev RaW SSD, which comes in 1TB and 2TB sizes, is perfect. 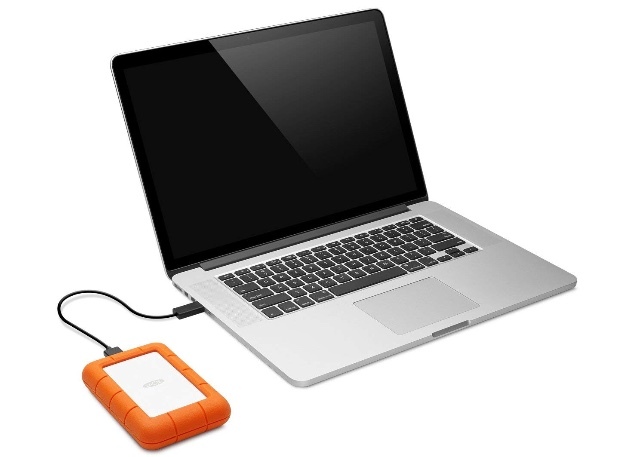 Much like LaCie’s Rugged Mini, this drive is shock-resistant, with a rubber bumper that helps it withstand drops of 6.5 feet. It has read speeds up to 425Mbps with connectivity options that include USB 3.0 and USB-C. At 5.14 by 3.29 inches, it’s also small enough to fit in your pocket. And for Mac users, it natively supports Time Machine and FileVault. The downside to this speed and convenience is cost: be ready to shell out about $380 for 1TB of storage space.